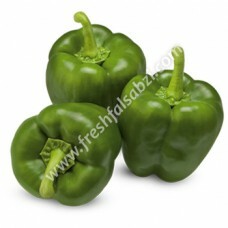 Capsicums also called peppers or bell peppers contain three reasons to be loved. One, it adds an active personality to your food due to its vibrant color. Two, it combines into any dish and gets out a certain zing and savor. Capsicums green provide more than 100% of the daily requirement of Vitamin C. Capsicum is rich in several phyto-nutrients especially antioxidants, dietary fiber and minerals like manganese, potassium, copper and magnesium.